Step ahead: St Benedict’s Bethany Conroy gets to grips with ‘Biofabrication’ during a STEM camp at QUT. 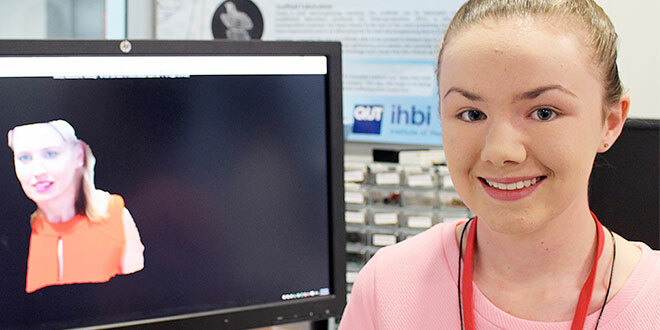 BETHANY Conroy is getting a head start on her future career after attending a Science, Technology, Engineering and Mathematics camp at Queensland University of Technology for high achieving Year 11 students. The St Benedict’s College, Mango Hill, student spent an exciting week in the QUT Vice-Chancellor’s STEM Camp, where she took part in various talks by industry experts and QUT researchers, including Queensland chief scientist Dr Geoff Garrett and Rodger Lawrence, chief technologist for Innovation in HP Enterprise Services. The speakers shared their vision for the next 10 years and the technological advances they expected to see with the camp participants. Bethany said the main goal of the camp was to complete a research project and present the findings to peers at the conclusion of the week. “The end goal was to construct a life-like prosthetic ear which can be used as a cosmetic solution for people suffering from Microtia, a congenital birth defect that causes children to have an underdeveloped or malformed ear,” she said. “The defect was often linked with children being deaf. “In some cases, children have one perfect ear, this can be scanned and bio fabricated to create another ear. The process involved scanning the patient’s ear using an iPad, and then, using free computer software, develop a 3D model, which was then printed. An inverse mould of the model was developed and finally, skin coloured, medical grade silicon, was poured into the mould to form the prosthetic ear. Associate Professor Woodruff said the goal was to have these prosthetics ready for implantation at the end of next year. Bethany said it was the first stage of Associate Prof Woodruff’s Future Hear project, and further stages involved creating a living ear and then bionics to help these children hear. She said she had really enjoyed the experience, getting to be part of a project that would change research in the health field and also many people’s lives. “I enjoyed working with other likeminded students as well as the academics, and thank Associate Professor Woodruff and her team for putting together an amazing project and working with us for the week,” she said. “I also would like to thank (St Benedict’s) Curriculum Leader-Science, Ms (Debra) Guthrie for her support in helping me apply for and attend this program. “Without her I would not have had this amazing opportunity.